How Do We Get To Playa Del Carmen From The Cancun Airport? Playa is a 45-minute drive south of the airport. Our front desk can provide a private van service for $180 round trip, max 8 people, child seats available. Best Transfers, a private car service, is $110 round trip. Other options: Taxi $70 one-way, Rental car, Hourly Express bus ($7 per person each way). How Do We Get To Playa Del Carmen From Cozumel Airport? Take the ferry to Playa del Carmen (a 40 minute ride). We are a few blocks from the ferry dock. You can walk or take a taxi. Where Are Your Properties Located In Playa Del Carmen? Do We Need A Car To Get Around In Playa Del Carmen? One of the best reasons for staying in a condo in Playa is that it is pedestrian friendly, very European, and more of a walking town. Everything is within 1 mile. We typically walk around town and rent a car on an as needed basis for regional excursions. We offer complimentary parking in our secure garage and there are several car rental agencies within a few blocks for those who wish to have a car to make day trips to Tulum or elsewhere. Do We Need To Get Pesos/Where Do We Get Pesos? You don’t necessarily need to have pesos. All stores and restaurants in Playa will take dollars and Euros. Most accept charge cards as well. There are ATMs nearby and places to change money, but . . . If you pay in US or Canadian dollars, the facility can give you any exchange rate they want, so it’s usually better to pay in pesos. We usually take about 100 dollars (per day) in ones, fives, and tens, and either pay with that or convert them to pesos. We usually bring about $100 in cash for every day we are staying in Playa. We keep most of it in the safe in our condo and only walk around with some of it. If you pay with a credit card, your credit card company may charge a foreign exchange fee and/or the facility can charge you a fee. Capital One has no fee, American Express is usually 1-2%, Visa and MasterCard can be 3-5%. Same is true if you get a cash advance on your credit card. There are ATM and Cashola (honest) machines everywhere. Each ATM charges a different service fee, so pay close attention as it can be ridiculously high. There are currency exchanges every block or so on 5th Ave. Although they show credit cards on there signs, they usually only convert cash (one of those things I can’t explain why). You’ll see exchange rates posted at each exchange and they all are a bit different, but we’re talking about a couple of dollars different per hundred dollars. La Quinta Avenida is the main street in Playa and has become a focal point for tourists, with its typical Mexican atmosphere and feel. There are no cars allowed on this pedestrian street, allowing you to stroll along at your leisure. Here you’ll find a diverse array of restaurants with cuisines from around the world that will satisfy even the most demanding of palates, along with a fantastic range of shops, and an excellent variety of services for tourists. The peaceful ambiance of the avenue coincides perfectly with the tranquillity of the sea, which is a little over 500 feet away. How Early Do I Need To Book My Reservations? If you want a reservation from December 23 – January 3, you should book no later September 1. Availability dwindles significantly in September. If you want a reservation over Easter, you should book no later than 3 months prior to the date. Availability dwindles significantly 1-2 months prior to Easter. Same is true of Thanksgiving. El Taj Ocean books early year round, especially the better units and the 1 bedroom units. It’s best to book at least 3 months prior to your desired dates. Am I Guaranteed The Unit I Reserve? When we book a reservation, it is for a specific unit. The only reason a last minute switch would happen is if the condo you reserved had a repair or maintenance problem that would make it un-rentable: a broken pipe, non-functioning air-conditioning, etc. When we reserve a unit for you, no one else can reserve that unit for any reason. Do You Really Own Your Own Units In Playa Del Carmen? Yes, we have a couple of units, but I am authorized to rent any of the 100 condo’s in the 5 properties we are part of: El Taj Ocean, Porto Playa, El Taj Beach, Maya Villa, and Villas Sacbe. Can You Give Us Some Options Of Available Condos In Any Of The Properties? Yes, just contact me. I want you to have the best condo for your needs. I’d rather rent you someone else’s condo if it better suits you. I like happy guests who return again and again. Is El Taj Ocean Right On The Beach? Yes, it is located on the beach with great views of the Caribbean Sea. If El Taj Ocean Is On The Beach Where Is El Taj Beach? Are Porto Playa, Maya Villa And Villas Sacbe Really 100 Steps From The Beach? Yes. All properties are located on First Ave (see map). Do We Really Get Complimentary Beach Chairs At Indigo Beach And Complimentary Use Of The Gym? 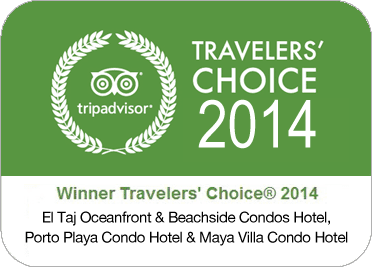 Yes, all of our guests (El Taj Ocean, Porto Playa, El Taj Beach, Maya Villa and Villas Sacbe) get these amenities. Can We Swim And Snorkel In The Ocean In Front Of El Taj Ocean? Our beach is rated as one of the top beaches in Mexico because of its soft white sand and calm aqua blue water providing safe and enjoyable swimming conditions for people of all ages. The reef off our shore offers excellent snorkeling conditions with a multitude of colorful coral formations and exotic fish and marine life but you will need to hire a snorkeling guide with a boat to get there. You might read a few reviews about fishing boats parked in front of El Taj Ocean. There are some fishing boats between El Taj Ocean and Porto Real. Some days there are 1 or 2, other days there could be 5-6. Playa was a fishing village at one time, and respect is shown to the fishermen who have tied theirs boats in this bay for decades. There is plenty of beach and water for us all to coincide. Of course! Let us know what you need: transportation, grocery shopping, a chef for the day, babysitting, in-house massage, tours & excursions, tee times, and emergency & medical assistance and more. How Often Do We Get Maid Service? Unless you have made other arrangements with us, you will receive daily maid service that includes fresh linens, bath and beach towels, soap, shampoo, paper towels, bottled purified water, laundry detergent for the washer/dryer room, and trash removal. Do You Have Tv, Phone And Internet Service? We have cable and flat screen HDTVs, cable service, and phones in all units that are included in the rate. High speed wireless internet is available for $10.00 per day, $25.00 for 3 days, or $50.00 per week. Small dogs are allowed. If there is any damage or additional cleaning needed upon your departure, you will be charged accordingly. All floors are marble and units are cleaned top to bottom between reservations, so if you have allergies, you will not experience issues. Where Can We Get Groceries And Drinks To Keep In The Condo? We have several small markets within one block and several full service grocery stores (Super WalMart and Mega) within 6 blocks. Walk there and take a cab back. Cabs are lined up in the parking lots of both places. NOTE: Bring an ID with you if you are going to use a credit card!!!! Can We Get The Refreshments In The Unit So They Are There When We Arrive? Absolutely. Give us a list of food, beverages (including wine, mixers, beer, alcohol, soda, etc) and it will be waiting for you when you arrive. Cost is $35 plus the cost of the groceries. What If We Want A Chef To Make Dinner For Us Or Cater A Special Party? We have a handful of chefs in the area that you can hire for meals. They charge $150 for 1-5 people and $250 for 6 – 10 guests (plus the cost of groceries). If you wanted a chef for the day for 6 people or less, a chef is $200 for the day ( plus the cost of groceries. How Do We Pay For Our Reservation? Reservations may be made by major credit cards (American Express, Visa, Master Card, Discover Card) and Paypal. Upon approval 50% of the total reservation amount will be charged to your credit card. The balance is due (30) thirty days prior to your arrival date. This balance will be automatically charged to the credit card on file. If the balance is not approved we will attempt to contact you in order to select another method of payment. Failure to make the balance payment within two days from notification will result in cancellation of the reservation and forfeiture of the deposit on file. We recommend that you purchase Travel Insurance. All rates are in US Dollars. In cases where the arrival date is less than (30) thirty days, your credit card will be charged the total amount. Cancellations will be processed specifically by the policy created by our Property Management Association. Sorry no exceptions and cancellation fees are strictly enforced. To protect against cancellation caused by unforeseen events such as illness, strikes, weather, acts of GOD, Etc., we recommend you purchase Trip Insurance to insure a refund of your deposit. 20% of the Condo Hotel rental price if the cancellation is received 30 days prior to the beginning of the rental period. The total Condo Hotel rental price will be forfeited for any cancellations received after the 30th day prior to the beginning to the rental period. A credit card with signature on file will be kept for any open balances or adjustments during your stay (in room mini bar, internet, phone, and concierge services). A $250.00 security deposit on your credit card will be required upon arrival. Excessive cleaning including upholstery, breakage, soiling or damage to the interior or exterior caused by the renter may be subject to additional fees to the renter. You are required to leave the unit as you received it. Check in is after 2:00 PM. If you arrive early and your unit is not yet available, we can secure your luggage until your condo is ready. If your unit is ready prior to 2 pm, we are happy to provide early check-in for you. Check out is at 12:00 PM. For late departures our fitness club can secure your luggage and provide you with lockers, showers, towels and toiletries so that you can enjoy the remainder of the day and freshen up for your return trip. Where Do We Check-In? What Are The Exact Addresses Of The Properties? Col. Centro Playa del Carmen, Quintana Roo. Col. Centro Playa del Carmen, Quintana Roo.